Performing an escape act on the sport’s grandest stage, the Cardinals were the first team to emerge victorious in a World Series that ended with the tying run on third base. It happened in Game 7 of the 1946 World Series between the Red Sox and Cardinals. Game 7 of the 1946 World Series is best remembered for the daring dash by Enos Slaughter from first to home on a hit by Harry Walker that scored the decisive run in the eighth inning, earning the Cardinals their third championship in five years. What often is overlooked is the Red Sox nearly tied the score in the ninth. Cardinals left-hander Harry Brecheen was pitching in relief in Game 7 in 1946 after having achieved wins in two starts in the World Series. Rudy York led off the Red Sox ninth with a single and Bobby Doerr followed with another single, advancing York to second. Red Sox manager Joe Cronin replaced York with pinch-runner Paul Campbell. That brought to the plate Pinky Higgins, 37, a 14-year big-league veteran. In what would be his last major-league at-bat, Higgins grounded to third baseman Whitey Kurowski, who threw to shortstop Marty Marion to get the force on Doerr at second base. Campbell advanced to third on the play. With one out, Roy Partee batted next and popped out to first baseman Stan Musial for the second out. Cronin sent Tom McBride, a right-handed batter, to bat for pitcher Earl Johnson. McBride hit .301 in 1946, including .333 against left-handers. In the press box, some expected Cronin to use Don Gutteridge as a pinch-runner for Higgins at first base, but Cronin didn’t make the move. Brecheen threw “a good screwball” and McBride rapped it on the ground. 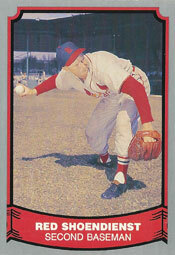 Second baseman Red Schoendienst got to the ball and gloved it, but the ball rolled up his arm. Schoendienst kept his cool and flipped a low, underhand toss to Marion, who caught it in time to nip Higgins at second base for the final out. In his book “Stan Musial: The Man’s Own Story,” Musial told writer Bob Broeg, “Our hearts stood still” as the ball rolled up Schoendienst’s arm. “Red looked like a magician pulling a rabbit out of his sleeve when he finally flipped the ball to Marion,” said Musial. “Cronin’s critics insist Gutteridge would have beaten the play at second,” enabling Campbell to score from third with the tying run, Keener concluded. The play had another benefit for Schoendienst. He wanted to marry his girlfriend, Mary, but her grandfather, Patrick O’Reilly, said he wasn’t keen about a “German” joining the family.